1. Emirates Airplanes have showers on board. Before you get too excited about your next Emirates flight, you only have access to the shower facilities if you spend a few thousand dollars on a first class ticket. If you happen to be upgraded or you actually did spend a few dollars on a first class suite, it still doesn't guarantee that you get to shower in the skies. Only Emirates Super Jumbo, the Airbus A380 has a shower on board. Most of Emirates 777 come with a First Class but unfortunately without a shower... and not even a bar. 2. Emirates 100th Airbus A380 is about to Arrive. Since we are already talking about the Airbus A380, the Dubai based airline is due to welcome it's 100th "Super Jumbo". Emirates is the worlds 4th largest airline by scheduled revenue passenger-kilometres flown and operates the biggest Airbus A380 fleet in the world. 42 more 380's are still on order and expected to join Emirates within the next few years making it 142 in total. The second biggest operator of the Airbus is Singapore Airlines with 19 planes followed by the German airline Lufthansa which has 14 380's in service. 3. Cabin Crew from over 150 different countries. 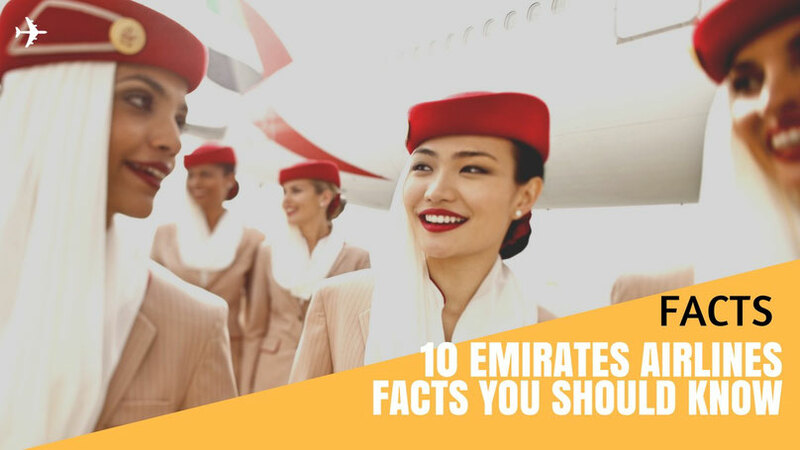 On an average Emirates flight, you’ll have at least 12 different nationalities of cabin crew speaking between 9 to 18 languages among them. The UAE is an expat dominated society and locals are hard to find. I have lived in Dubai myself for a year and I have never met an Emirati. 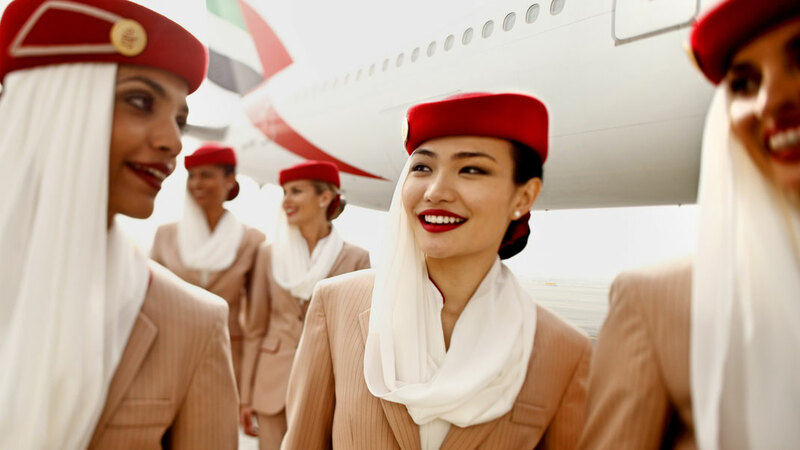 The majority of the 20,000 cabin crew employed by Emirates come from the UK, no surprise by an average 20 flights between Dubai and the United Kingdom. Those are followed by Australian crew and Egyptians as well as Indian and Filipino Crew. 4. First Flight from Dubai to Karachi in 1985. Believe it or not but Emirates was only founded in 1985, a little more than 30 years ago. The airlines first flight took off on October 25 in 1985 on a Boeing 727, which was provided by the Royal Family to Karachi in Pakistan. Flight EK600 was a historic milestone and the birth of an airline which should 30 years later operate more than 3,600 flights a week to 140 cities in 80 countries around the world. 5. The largest Wide-Body Fleet on Earth. Emirates is one of the few airlines on earth which only operate a wide-body fleet. In fact the Gulf carrier only uses 2 kinds of airplanes, the Airbus A380 as well as the Boeing 777. Emirates is the worlds largest operator of both airplane types. This makes 234 planes in total. The greatest thing of such an identical flight is that each of the 98,244 seats Emirates offers is identical. It's is also the only airline in the world where every seat comes with a personal screen. Well, you certainly know what you get! 6. Emirates longest flight takes 17 hours and 25 minutes. In 17 hours you could comfortably fly from London to New York, have a Starbucks coffee in Manhattan and fly back to the UK or alternatively you could fly from Auckland, New Zealand to Dubai on the longest Airbus A380 flight in the world. The inaugural flight EK449 took place on 2 March 2016 and was even the longest flight in the world back then, only to be succeeded in 2017 by Qatar Airways daily flight from Doha to Auckland. 7. Dubai Airport the 3rd busiest on Earth. 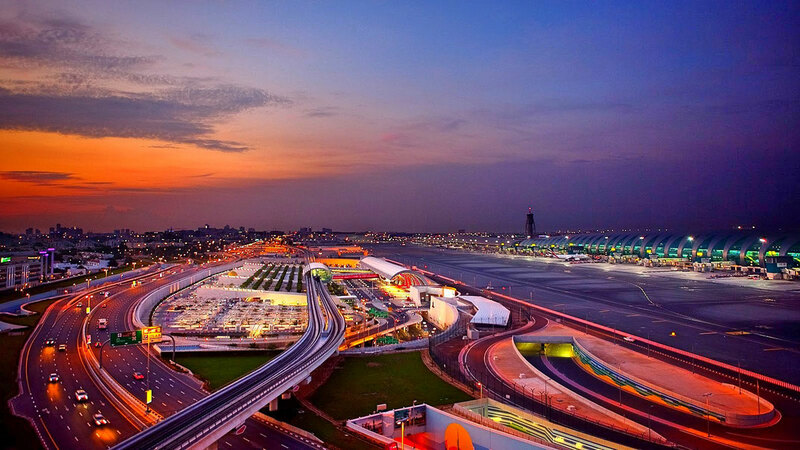 Dubai International Airport is the 3rd busiest in the world after Atlanta Jacksonville and Beijing Capital Airport. While those 2 airports mostly handle domestic traffic, DXB traffic is almost purely international. In 2016 Dubai Airport witnessed 83,6 million passengers which was almost as twice as much as in 2010, only 7 years ago. Out of those 83 million, 56 million were travellers booked on an Emirates flight. The airport also serves as an hub for FlyDubai, Emirates sister airline. 8. Emirates a supporter of Global Football. 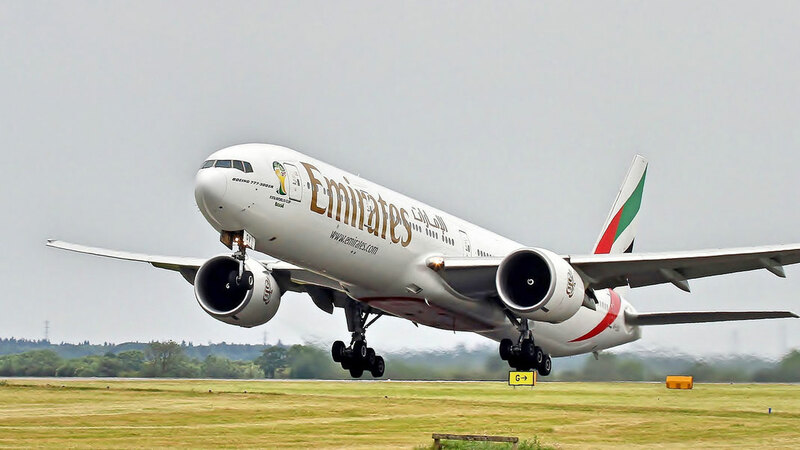 Emirates is not only a very successful airline but also a well-established brand around the world, with a big focus on sponsoring sport events and clubs around the world, especially football teams. Emirates is one of the main sponsors for clubs such as Real Madrid, AC Milan, Paris Saint-Germain or Arsenal London. The home ground of Arsenal is called the Emirates, one of the most modern football arenas on earth. Emirates was also a main sponsor of the FIFA World Cup, and in 2014, when Mario Gotze scored the winning goal for Germany against Argentina, the Emirates logo happened to be shown on the advertising board behind the goal seen by approx. 3 billion all over the globe. 9. 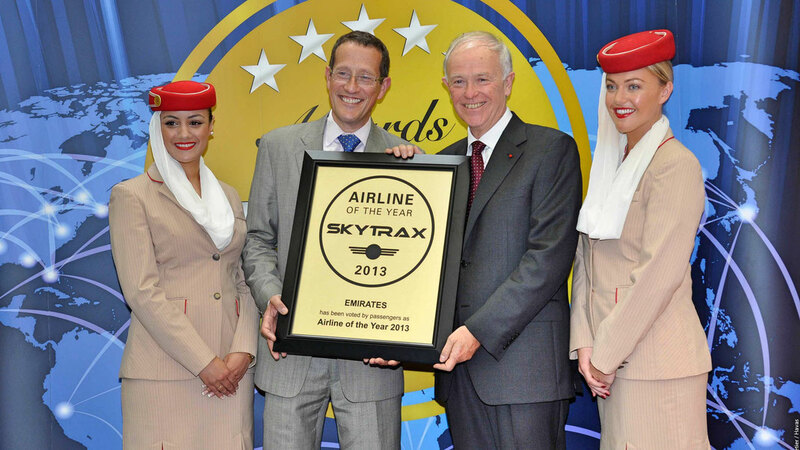 Skytrax Airline of the Year for four times. The Dubai based carrier is extremely popular and the brand itself was valued at 7 Billion US-Dollars in 2016. But the airline was also awarded as Skytrax Airline of the year in 2001, 2002, 2013 and 2015. 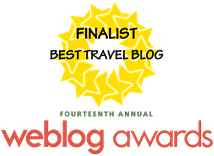 It is the biggest honor an airline can receive within industry. Every year more than 20 Million passengers from around the world are asked to leave their opinion which results in an annual Top 100. In 2017 Emirates was voted as the 4th best airline behind Qatar Airways, Singapore and ANA from Japan. 10. Emirates is not part of any Alliance. Emirates is the only major airline in the world which is not part of any alliance. The 3 major airline alliances, Star Alliance with members such as Lufthansa or Thai Airways, OneWorld with British Airways or Qatar Airways and also SkyTeam with Aeroflot or China Southern have always tried to convince the Middle Eastern giant to join their programmes and join the team, without any success though. CEO Sir Tim Clark isn't a big fan of those networks and rather stay independent. However Emirates does has codeshare agreements with airlines such as Qantas, South African Airways or SriLankan.